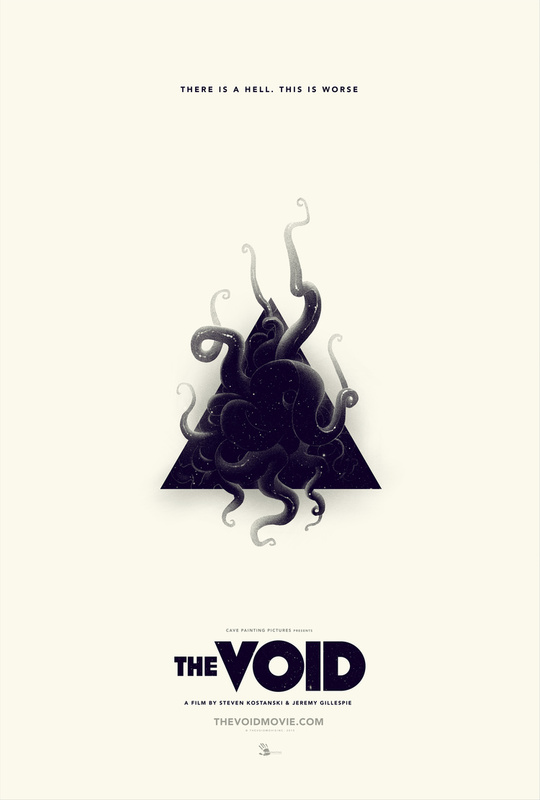 The Void, a movie I've been hyped up for from posters alone and the promise of practical special effects and you probably won't get to see until next year had a special free screening at BeyondFest. This took place Monday night thanks to Shudder, an online horror movie channel sponsoring it. The screening was packed and even had a standby line, though it was in the smaller Spielberg Theater at the Egyptian. Let's get into this total homage to The Thing with an updated modern feel of dread from part of The Astron 6 collective, the people who gave us Manborg and Father's Day. Mix in a crazy triangle worshiping cult, a hospital on it's last legs due to a fire and the ol' standard of a married couple having a fight and you have The Void. This indie film would be hard to distinguish from a big studio if not for the use of practical effects instead of CGI every five seconds. The conventional creatures and blood feels all the more real, all the more unsettling when you see it. Many horror movies fail on forgetting to tell a story, breaking it's own rules or just being ludicrous. This film finds a heart in all the organs its tentacles whirl through. Not only heart, but a few moments of levity and of earnest reaction to what is a terrifying situation. The characters for once actually freak out as they should seeing monsters. And even after seeing something horrible or dealing with what might be a cliche moment the characters give us a funny and realistic convenience of being pissed someone decide to go off on their own when they were specifically told not to. While I could predict one key plot point and I assume many horror fans might, the film still felt like a true thriller and horror experience with a situation going from bad to worse in a grand fashion. Daniel Carter (Aaron Poole) an officer and our main character to connect with. We follow him on what seems to be a slightly irregular night dealing with a drug addict out in the forest in the middle of nowhere. Little those he know his night isn't going to get much simpler. Already in a bad mood he's taking the addict to the closes hospital, which just so happens to have his wife, a nurse, Allison working at it. They are on bad terms. The hospital isn't doing well either. It's closing down, a fire has made it almost useless...for the living. Daniel drops off the addict, we meet the rest of the cast and then we meet...what the Hell is that? For some unknown reason one of the nurse snaps, kills a patient and cuts off her on face, this results in her death ...for now. What comes back, well it just ain't right. If you like Croneberg or are a fan of the Thing this movie has many more nasties for you to start throwing up to. This new nurse thing hybrid leads to a fight with axes and guns, and isn't pretty. It's pretty to watch, it's a huge mess though. Two guys going at a giant, uggh, thing while it's absorbing someone else. It'll leave a mess. I can't remember a time I've seen someone cutting someone or something with an axe look so believable. After that fiasco it's nowhere near over as it's just the start of a horrible night at the hospital for Daniel and the rest of his crew. Then Daniel meets the cult. They are not helpful in the slightest. These triangle wearing hooded clad white weirdo's aren't trying to even get into the hospital they seem more concerned with not letting anyone out. The first meeting between Daniel and a cultists really sets the tone of who Daniel is, a nice helpful guy, whose having the lousiest day of his life dealing with jerks and freaks. Aaron Poole plays a protagonist you can follow to the end and you want it to just get better for him. And it only gets worse for Daniel here as the hospital is way more than it seems. On a practical effects note...I just hope this wins some awards. There are gruesome monsters here. Vile creepy, "Oh, no," things that nightmares are made of and they even have their own sort of section of the movie. You have those moments where you'll want to look away with sounds that sound wrong. Then you have another layer of the faceless minions, the cult keeping you in, wielding knives to cut you up. The main baddie has a wonderful role in the film and backstory and voice that you'll love to hate after quite the reveal, that I did not see coming. The Void would make a great part of a double feature with The Thing. A perfect sort of follow-up with more of a mystical reason for why people come back from the dead and want to stick you with tentacles and gain your flesh. If you want something crawling up your spine you'll want to see this.